Our Minibus system provides convenient service seven days a week throughout the Leisure World community. Minibuses operate Monday through Friday from 7:30 a.m. until 7:15 p.m. and on Saturday, Sunday and Holidays from 7:00 a.m. until 8:00 p.m. The Minibus fleet consists of eight easily recognizable blue and white shuttle buses. 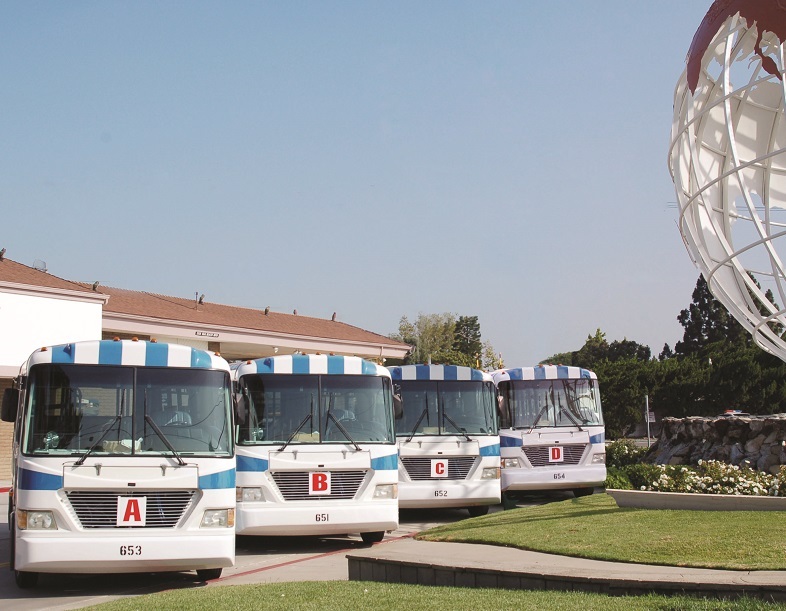 Week days, Monday –Friday, four (4) of these shuttles provide up close passenger service during daytime hours to nearly every street, and most carport areas in Leisure World. Weekend and evening shuttle service is limited to coverage of only most major streets within Leisure World. Recent annual passenger counts have indicated that 58,000 passengers, per year, have boarded our blue and white shuttles. There are over 60 bus benches and shelters throughout the community for the convenience of those who use our shuttles. A hallmark of our shuttle service is that passengers may board the Minibus shuttles from any safe curbside location along any of the Minibus routes simply by waving at a blue and white Minibus shuttle as it approaches. By using LPG (propane) fuel in our in our Minibuses, the GRF Transportation Department has been environmentally friendly for more than thirty years. One-half of the Minibus shuttles use LPG as their fuel source. This reduces air pollutants and operating cost, while providing a convenient and safe way to travel within the community. The blue and white Minibus fixed route shuttles are identified by large block letters on all four sides of each Minibus. There are four different lettered weekday Minibus routes: A, B, C, and D, routes provide service from approximately 8:30 a.m. to 4:30 p.m. There is an early morning limited service route M-F from 7:30 a.m. to 8:30 a.m. and an evening limited service route M-F from 4:30 p.m. until 7:15 p.m. Our Saturday and Sunday weekend schedule provides limited service from 7:00 a.m. until 8:00 p.m. During the evening and weekend limited services hours, passengers may request the Minibus driver to take them to any location within the Leisure World community. Every Minibus shuttle route trip is approximately 38 minutes in length, with a five-minute layover at the Health Care Center between trips. (Twice daily each route will have a twenty-minute layover at the HCC. See printed schedule book) Weekdays, many apartment locations allow most residents easy access to more than one bus route during peak weekday service hours. Often this will allow passengers to shorten their total ride time on the Minibuses. 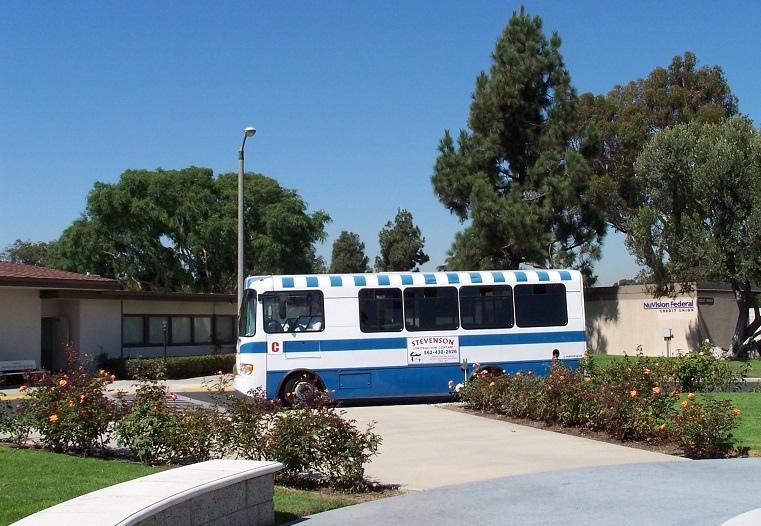 All Minibus routes regardless of the letter on the bus will take passengers to all of the following locations: Main Gate Entrance, Health Care Center on Golden Rain, Seal Beach Village Shopping Center, Library, and all Clubhouses. (Note; the ‘A’ route bus does not service Clubhouse 2 and the ‘C’ route bus only provides close-by service to Clubhouse 2) Monday through Friday there are buses at all of the above locations approximately every fifteen minutes, all day long, 8:45 am to 4:15pm. Additional Minibus service hours are provided for the Summer Amphitheater Concert series and events like the Holiday Light Tours. Check the printed Minibus schedule or watch for information in the Golden Rain News. A Minibus informational class is conducted every month in Clubhouse 3 on how to navigate the Minibus service and schedules. Additional information is also presented on other transportation services available to the Leisure World community. Dates and times of the classes are published in the Golden Rain News. Printed Minibus schedules are available from the Minibus drivers. Additional locations to pick up a copy are the Library, Main Gate Security office, Stock Transfer / Distribution counter, and the Golden Rain News office. New Minibus schedule booklets are delivered to all residents as changes in the schedules warrant. The schedule booklets also contain information on other free non-Golden Rain Foundation transportation services such as, the appointment based City of Seal Beach Dial-A-Ride program; the City of Seal Beach sponsored Leisure World Shopper shuttle to Old Ranch Town Center and the Shops at Rossmoor, and the Los Alamitos Medical Center shuttle. Contact information is also provided for the Orange County Transit District buses that stop at the Main Gate entrance to the community. A special Leisure World appointment based Access Bus service for shareholder residents with disabilities is available seven (7) days a week. This service is only for those passengers who cannot use the regular blue and white Minibuses because of a disability or limited mobility. Service on the Golden Rain Access bus is available Monday – Saturday, 7:45 am until 3:45 pm and on Sundays from 7:00 am until 1:00 pm. The Access bus provides service to all destinations serviced by the regular Minibuses. The Golden Rain Access bus is white with a large orange stripe above the front windshield for easy identification. Appointments for service can be made up to three (3) days in advance. Appointment times are limited and available on a first come, first served basis. More information is available in the printed Minibus schedule booklet or by calling 562-431-6586, extension 372. The Golden Age Foundation has generously donated buses to the Leisure World Community use by Access passengers.